The basic pattern of descent is shown pretty clearly with this data. Animals you’d expect to be related are clustered into groups. For example, primates are a subset of mammals, and apes (including humans) are a subset of primates. Humans, Chimpanzees, Gorillas, and Orangutans all have an identical protein sequence of cytochrome-c (and the DNA sequence varies slightly among them). Birds are a branch out of the reptiles group. Whales are clearly part of the mammal group – not the fish group. – Frog appears inside the “Fish” group. It also doesn’t appear next to bullfrog. – Horsfield’s Tarsier appears with rat, mouse, and guinea pig. Tarsiers are related to monkeys (it should actually appear roughly where kangaroo does). – The kangaroo (a marsupial) appears inside the placental-mammal group. – Honey-bee appears outside the ‘insect’ group and near starfish, earthworm, and snail. – Bat appears near seal and dog. – Why don’t mammals appear as a subset of reptiles (since mammalian ancestors were reptiles)? – Why don’t reptiles/amphibilians appear as a subset of fish (since terrestrial vertebrates evolved from fish)? First of all, genetic studies of individual genes have certain limitations. While the general pattern of decent can often be shown from a single gene, the details can be confused due to inherent problems of small datasets. Creationists sometimes use genetic studies on a single gene as if it’s perfect truth, and if anything varies from accepted evolutionary theory, they’ll argue that those problems are evidence that evolutionary theory disagrees with the facts. The problem is this: genetic studies on individual genes is a little bit like a public poll. Even if you perfectly randomize the people answering your poll, it’s still susceptible to inaccuracies. For example, if you randomly call phone numbers, you might discover that 9 out of 10 respondents support a particular candidate, even when the reality is that it’s a 50-50 split among the public. Studies of single genes have the same problem, and, in both cases, this is a problem that is more likely to occur with a small dataset. How do these problems arise with genetic data? It has to do with mathematics of mutation, and limited information. Statistically, it’s unlikely situation #2 would happen. It requires that Species4 happens to get exactly two mutations, and those two mutations exactly match the mutations in other species. However, it’s not statistically impossible. And since it’s not impossible, it will happen with a frequency equal to its likelihood. It’s also possible that a mixture of the two situations occurs. So: when two species have the same mutation, it might be that they gained it through common ancestry, or they might simply be coincidence. When dealing with large numbers of mutations, you can quickly sort-out which is which, but with fewer numbers of mutations, the correct interpretation is less certain. First, let’s pretend we have a 100 amino-acid sequence. Let’s also say that each location can contain two different possibilities (the other 18 amino acids disrupt the protein’s function, killing the organism). (1) The more species there are, the more likely two of them will have an identical mutation by coincidence. If we have two species, and each of them have an independent mutation, then the odds that they will be the same mutation is 1 in 100. However, if we expand our example to contain 15 species, each with one independent mutation, the odds that two species’ mutation will match becomes extremely high. In fact, on average, there will be one matching mutation. (The fifteenth species has a 14% chance of ‘hitting’ an existing mutation because there are already fourteen separate mutations in the group.) The situation gets worse and worse the more species that are added to the group. That common mutation might be interpreted as “a common mutation acquired through common ancestry”, but that’s an incorrect conclusion. (2) The more independent mutations a species has, the more likely it is that one will overlap an existing mutation in another species. Imagine that our two species have each acquired 20 independent mutations. What are the odds that one of the mutations in Species1 will match a mutation in Species2? Statistically, we can expect that around 4 mutations will match ( 0.20 * 0.20 * 100 locations = 4 ). Again, the situation becomes more likely with more mutations. None of those mutations were actually acquired through common descent, but it will be interpreted as commonly acquired mutations. (3) Back mutations also make the situation ambiguous. 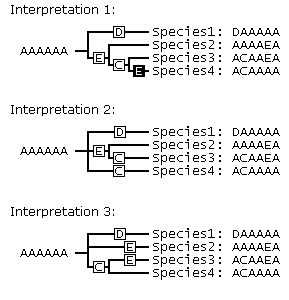 Let’s say we begin with four species with this sequence of mutations. Species 4 has a back mutation (changing “E” back to “A”). The resulting sequences are ambiguous. What should the interpretation be from the sequences alone? The problem of back mutations increases as the number of independent mutations increase. This is because the possibility of a back mutation is proportional to the number of total mutations. There is a small area of commonality (section A), and a large area of independent mutations (section B). Cytochrome-C contains 104 amino-acids, and the honey-bee and snail versions differ at 26 locations. What happened was that a few mutations overlapped, it matched slightly better than other species on the chart (perhaps due to back mutations), so it erroneously placed it next to ‘snail’. The frog and kangaroo follow this same pattern. While one would expect ‘bullfrog’ to be a close relative of the frog (i.e. Western Clawed Frog), they actually differ at 15 locations. The large number of differences shows that their common ancestor lived a long time ago – which shows just how ancient the ‘frog’ group is. And Kangaroos are the only marsupial on the chart. The Kangaroo protein sequence should be equidistant from all placental mammals, except for some random coincidental mutations. It just happens that those coincidental mutations placed it near the primate group where it clearly doesn’t belong. In fact, different analysis algorithms place the kangaroo in different locations, indicating how tentative its current placement is. Including some other marsupials in the list should stabilize it’s location outside the placental mammal group. None of these four species have any close relatives on the chart, they have a large number of independent mutations, so the software probably found the best match based on coincidental mutations. Horsfield’s Tarsier is also an anomaly. It should appear at the base of the primate group. Either this is just a case of an odd coincidental mutation placing it elsewhere, or perhaps tarsiers shouldn’t be classified as primates. (Some people have suggested that.) In the end, a larger genetic analysis should clear up what’s going on. 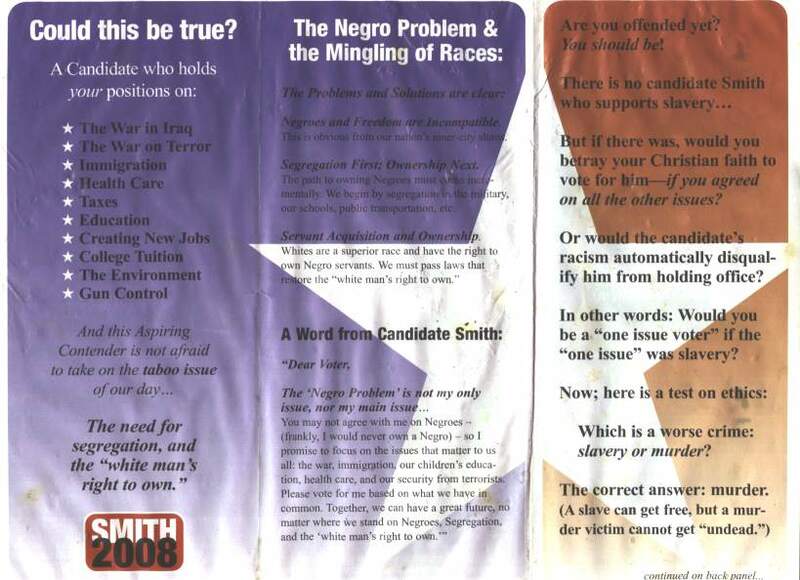 The fliers pretend to advocate a white-supremacist candidate (“Smith”) who supports slavery for blacks. Obviously, you’re shocked and appalled. Then, it does a switch: it says that abortion is murder, and murder is worse than slavery, therefore, you cannot support a candidate who allows abortion any more than you can support a candidate who advocates slavery. The white-supremacist fake-out certainly catches people’s attention. It’s the shock-politics of the pro-life movement. A second flier then talks about Obama’s voting record regarding abortion (he supports it, McCain opposes it). 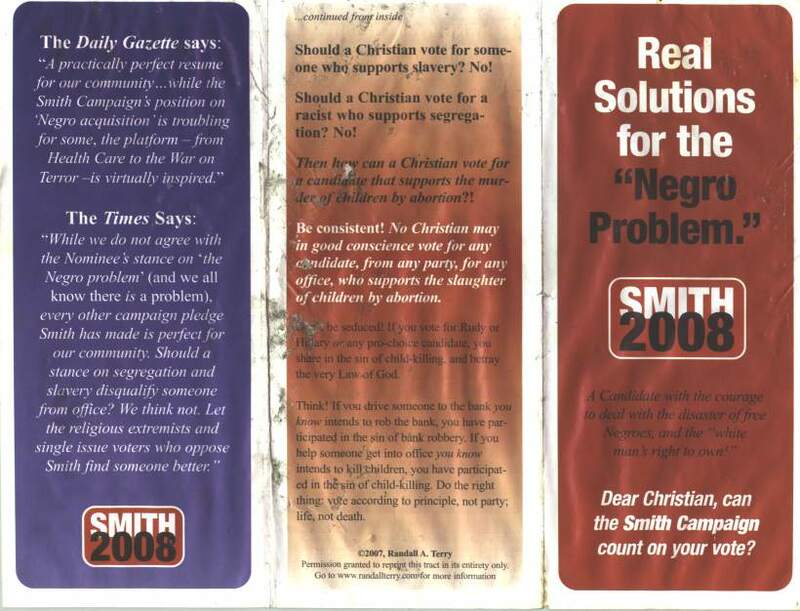 During the anti-abortion pitch, the flier talks a great deal about how a Christian should vote, but ironically enough, the heavy focus on how a “Christian should vote” resonates as the kind of rhetoric you’d expect from a Southern redneck advocating segregation. No Christian may in good conscience vote for any candidate, from any party, for any office, who supports the slaughter of children by abortion. Don’t be seduced! If you vote for Rudy or Hillary or any pro-choice candidate, you share the sin of child-killing, and betray the very Law of God. And that was it. Each represented personality came from a separate, long-established yahoo mail account. I can hardly believe it actually happened… that someone actually thought I would fall for their ever-more-specific claims. It felt like the same person coming up to my “Free Candy” booth four times, wearing lame disguises with each visit. And just so you know, the money in Dallas was wrapped in the centerfold pages…from Oprah’s “O” Magazine. Since they were all from longstanding email addresses, I have to wonder: Was it one person who had a whole series of fake email addresses to pull-off scams? Was it a group of friends/coworkers trying to get the money? I nominate this for the most ridiculous book I’ve seen all year. It has a chapter for each astrological sign, giving you personalized advice on what you should wear on the golf course, the preferred signs of your golf partners, and whether or not you should buy used clubs. Eurogamer: You describe yourself as an atheist; take the so-called militant atheists like Richard Dawkins and Christopher Hitchens, who see faith uniformly as a bad, negative and dangerous thing. Do you see it more benignly, even if you don’t necessarily believe? Will Wright: Oh, I definitely see it more benignly. I see a lot of benefit and danger in religion like anything[…] I think our bigger fear was that we didn’t want to offend any religious people; but looking at the discussion that unfolded from this thing, what we had was a good sizeable group of players that we might call militant atheists, and the rest of the players seemed very tolerant, including all of the religious players. And most of the atheists were very tolerant as well. I didn’t expect to hit hot buttons on the atheist side as much; I expected it on the religious side. But so far I’ve had no critical feedback at all from anybody who is religious feeling that we were misrepresenting religion or it was bad to represent religion in the game. It was really the atheists! My only issue with Will Wright’s comment was his use of ‘militant atheist’. In any other context, the word ‘militant’ means violent, taking up weapons, and killing people. (In fact, the images above are from the first page of google images when you search on “militant”.) It’s silly to use that to describe atheists who are complaining. These guys didn’t show up at his house with AK-47s and technicals. But that doesn’t stop everyone from jumping on the theme: ‘Militant atheists’ up in arms over Spore’s sim-religion. Now, “hardline atheist” I guess I’d be okay with that in the sense that it’s more accurate (though it has negative connotations), but at least it doesn’t erroneously hint at violence and killing. Update: It seems that Spore doesn’t just include religion as a method of managing your civilization. In fact, it would seem odd to complain about that, and many other games have done the same thing. Rather, when you reach the Civilization phase of the game, you can choose a military, economic, or spiritual path. Choosing the spiritual path gives your people access to magical powers (Faith Heal, Black Rain, and Messianic Uprising). I guess atheists had a problem with some realism (simulating a planet’s evolution Intelligent Design over billions of years), coupled with unrealism (gaining magical powers based on religion). I’ve heard a few things lately that the right-wing/Christian media have focused specifically on one issue: keeping a Bible on his desk (which is not any kind of offense, and certainly not one that would get him fired). They continually harp on this one issue and ignore everything else – creating the perception that Freshwater was fired for one and only one thing: keeping a Bible on his desk. Obviously, this gets the Christian / conservative / pro-free-speech people riled up because it creates the illusion of a heavy-handed liberal establishment firing a guy for having a Bible on his desk – as if the “liberals” are out to ban religion, and having a Bible can get you fired from a job. Here’s a video clip from Breitbart.tv titled “Hundreds Turn Out to Back Science Teacher Fired for Keeping Bible on His Desk”. See how long you have to watch the video before they even mention anything Freshwater did wrong (other than the allegation that he kept a Bible on his desk).